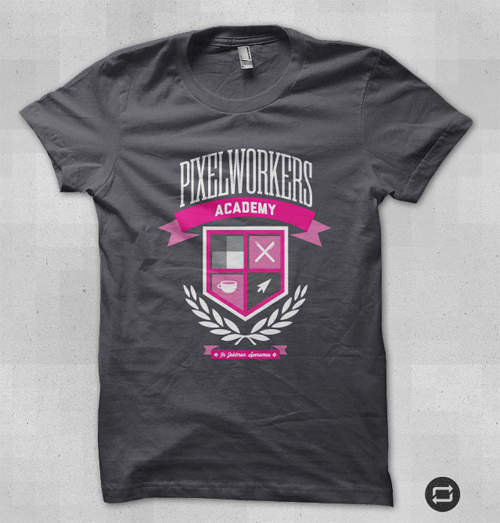 When I first got the email from the guys at United Pixelworkers asking me to do a t-shirt, I was over the moon, having seen friends design for them, and most recently acquiring the beautiful t-shirt by Meagan Fisher myself, it was certainly a challenge I wanted to accept. 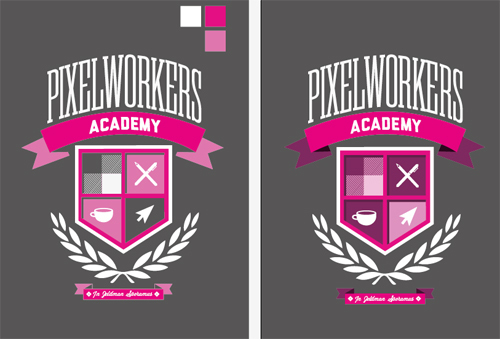 The brief from Pixelworkers was that it had to look like it had come from me, you’ll see all of the other t-shirts are engrained with the personality of the designer. 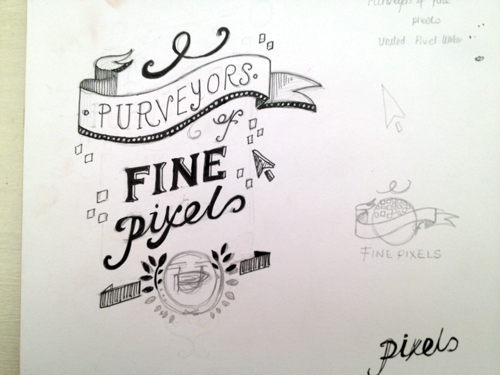 I originally wanted to go along the lines of an old vintage advert – given that I love everything from that era. I spent ages on this sketch, only to dislike it the very next day. The concept wasn’t strong enough and it felt like it didn’t really have a heart, apart from me liking vintage looking stuff. 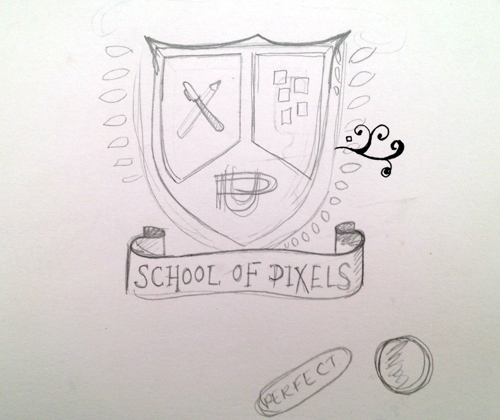 So I emailed Jay and said I was doing a complete 180 degree switch on everything I had told him I would be doing, and that I wanted to do a vintage looking school crest instead. I came up with this idea a while back but didn’t have an outlet for it – it seemed the perfect pairing. The first sketch to come out of my brainstorm was the one you see below. I originally wanted the tag line underneath to read “We Weareth Plaid” – poking fun at the well known fact that most of us wear plaid shirts at conferences – ironically, as I write this blog post, I’m wearing one myself. I bounced back and forth some ideas with Jay who came up with, “In Zeldman Speramus” – “In Zeldman We Trust”. I still wanted to get the plaid in there somewhere, so it ended up in the final digitised design, but doesn’t appear in any pencil sketches. 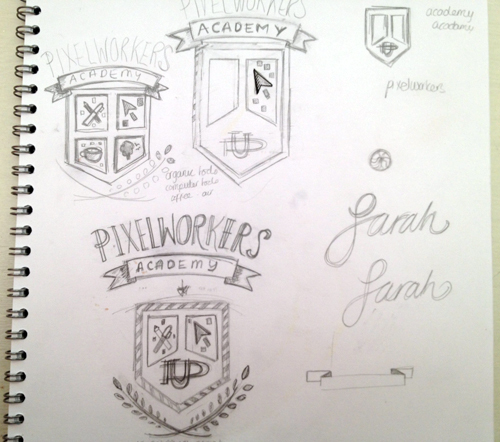 My third round of sketches are much closer to what you see in the digitised version. Then came the challenge of digitising – which actually wasn’t too bad considering it’s something I do rarely – I’m a Photoshop girl mainly, but I learnt so many new tricks from sitting in Illustrator for hours over the past week. The only thing I made a complete schoolgirl error of, was not realising the constraints on ink. I literally went mad, without thought – and the design on the right that you see below, was my 6 ink version – which I’m told is very costly to produce. So I got a lengthy email explaining how it all works (which I’m very thankful for) and managed to bring it down to three colours only. So there we have it, pretty much my whole process start to finish. If you would like to buy it, you only have 20 days – and then the shirt is retired and will no longer be for sale. Thank you to those who sent tweets last night saying how much you love the shirt, it made all the nights in illustrator worthwhile.